Includes the Forming DVD set (described below), and 10 Forming brochures. Forming offers new hope for individuals who desire to deepen their personal relationship with God. This course could be used in churches or communities to ignite a passion for a personal relationship with Jesus and to provide the necessary guidance and opportunities for the people to actually experience God more fully. This 5 DVD set of lessons and exercises provides almost seven hours (6:52) of life-changing instruction for the 12 sessions. Forming is one of the first entry points of the Thriving: Recover Your Life program. The Forming Open Group License Video is intended to be used with the Forming Student Workbook, and the Facilitator Workbook. Session 1 - Changing our Minds about Change: Learning how to engage with God for change instead of trying to make it happen through our own efforts. Session 2 - God is Relational: Understanding God's best intentions toward us are to build a working relationship with us, rather than judge our every move. Session 3, 4 - Developing a Conversational Prayer Life: Learning how to listen to what God wants to share with us about life. Session 5 - Grace is Actually a Means for Transformation: Understanding grace is not only how we become a Christian, it is also how we grow as a Christian. Session 6, 7, 8 - Ways to Engage with God for Change: Engaging actively with God and how to balance our part and God's part in this process. Session 9 - Renewing Our Minds: How to engage with God in ways that actually change how we see and think about all of life. Session 10 - Healing Our Identity and Self-hate: How to engage with God to heal our distorted self-image. Session 11 - Disarming Our Fear: How to engage with God to disarm our fears and build our trust in God. Session 12 - Two kinds of Maturity: Understanding what it means to �grow up in all things. 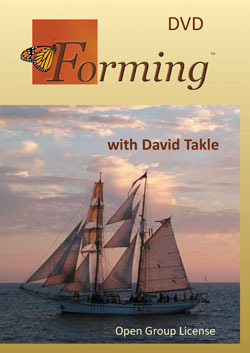 Forming is written by David Takle, M.Div. David is a graduate of Fuller Theological Seminary with a Masters of Divinity and a concentration in Christian Formation. David believes that God's intention is to build a strong vibrant relationship with each one of us so that we can live life more as God intends.